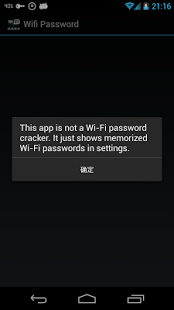 Wifi Password(ROOT) is an app created by farproc (whose official website is http://a.farproc.com). Wifi Password(ROOT) has a rating of 3.7 on the Play Store, with 80461 votes. Similar apps are: WiFi Password Show (by Phuongpn), Router Keygen (by Routerkeygen), Wifi finder (by JesusApps), Wifi Password Recovery (by InfoWork Tech), Root All Devices (by HEXAMOB S.L. ), Wi-Fi reminder (by Владимир Тимофеев), King Root Installer (by Sirome), Wifi Password Master (by Magdalm), WIFI-PASSWORD (by Unbrained Soft), WiFi Master Key (by wifi.com LinkSure Singapore), AndroDumpper (by Osama Abukmail), Root Checker (by joeykrim), WPS Connect (by FroX), SuperSU (by Chainfire). Wifi Password(ROOT) is currently available in the following countries: Peru, Switzerland, Romania, Israel, Turkey, Thailand, Germany, China, Japan, Netherlands, Denmark, Slovakia, Greece, Ukraine, United Arab Emirates, Poland, Estonia, Chile, Australia, Austria, Singapore, Indonesia, Czech Republic, South Korea, Colombia, Croatia, Serbia, France, United Kingdom, Sweden, Latvia, Lithuania, Norway, Finland, Hungary, Belgium, Hong Kong, Spain, Taiwan, Philippines, Malaysia, Russia, Bulgaria, India, Canada, Mexico, South Africa, Italy, Brazil, Portugal, Argentina, Saudi Arabia, United States, New Zealand, Egypt, Vietnam. Recover your keys for your wifi network. Free and powerful Wifi Password Recovery Tool.